First things first. This is not your typical Porsche 911 GT2 RS, which is also not your typical 911, for that matter. 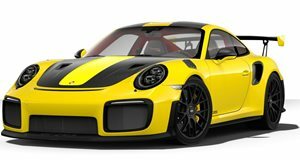 No, this is the 911 GT2 RS MR, with ‘MR’ standing for Manthey Racing, the so-called ultimate skunk works Porsche tuning shop. This 911 GT2 RS MR also just happens to be the world’s fastest road-legal car to have lapped the Nurburgring. And now Top Gear host Chris Harris has his turn at the wheel, only he’s not at the Nurburgring but rather the Formula 1 circuit in Portimao, Portugal. Manthey Racing claims it didn’t touch the 3.8-liter twin-turbo flat-six and its 690 hp and 553 lb-ft of torque. Instead, its focus was on aerodynamics, with modifications made throughout. Those differences can definitely be felt and Harris’ lap time says it all. It’s a full 2.5 seconds faster than he’s ever done at Portimao – and that includes times in hypercars like the Porsche 918 Spyder and McLaren P1. What are some the car’s other secrets for success? Its rear end is remarkably stable, which is often times an issue with the rear-engined 911. The traction upon exiting corners is also incredible. What about the Cup 2 tires? They’re important, yes, but the key elements that make this 911 GT2 RS MR so incredible are its aerodynamics and suspension. But what’s also quite interesting is that despite its exterior, which looks quite intimidating, the car handles remarkably easy. It looks like a monster, but it’s not. That’s not to say amateur drivers should give it a go, however. For 911 GT2 RS owners who plan on tracking their cars more often than it being a daily driver, the MR package, despite its added cost, is a must-have. It completes the car by giving it the ultimate track experience. And, if you’re good enough behind the wheel, you’ll out gun most hypercars, too. That’s money well spent.